Lawn Care Southern Maine - Prompt Professional Service 35 Years! Lawn Care Southern Maine – Prompt Professional Service 35 Years! 207 Lawn Care Southern Maine – Serving Biddeford, Saco, Arundle, Kennebunk, Kennebunkport, Wells, Sanford, Buxton, Scarborough, Maine Since 1984! We at 207 Lawn Care of Southern Maine have served the needs of discerning customers for 35 Years! So; this fact gives us a competitive edge in this business. We ask that you don’t just take our word for it, but that you give us a try for a season. Additionally; the owners are on the job. Therefore; in a climate of impersonal service, we stand out nicely. Yes; our primary focus is beautifying lawns. So; providing 35 years of hands-on experience achieves that! In fact; your yard is our best advertisement! Therefore; we have a vested interest in providing you with quality service. Grounds maintained by 207 Lawn Care in Southern Maine are often the envy of the neighborhood. So; we would appreciate to opportunity to serve you. 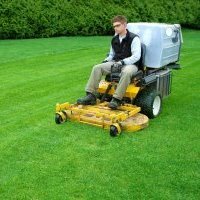 We carefully select commercial grade zero turn mowers. Because quality tractors are key to providing our customers with the expertise they need and deserve. We at 207 Lawn Care in Southern Maine kindly as that you call us early. Because; calling before the start of any season ensures that we can do business together. For example; calling us when grass is knee high, makes it difficult and costly to serve you. Also; contrary to some beliefs, cutting a season’s worth of tall grass doesn’t necessarily save money. Is my yard so bad that it’s earned the name “Desert Of Maine” and become a tourist attraction? Do your neighbors congregate on the sidewalk facing your lawn pointing at it with sneers and snickers? Are dogs naturally attracted to your property for relief? Have cats adopted your domain as their favorite litter box? Did the park service identify your jungle as protected habitat because of its strange and unique plants? Is warden service requesting use of your landscape for wildlife conservation? Your property ever been on the news due to landings of strange space crafts? Been approached by a traveling circus and asked for permission to set up tents? If you answered yes to any of these questions, it’s urgent that you call 207 Lawn Care Today! 207 Lawn Care in Southern Maine services many localities. Therefore; Please take a moment to review the list below. Furthermore; if your local isn’t listed feel free to call us anyways. Because perhaps you are located on the outskirts of our service area.